Redshift adjusts the color temperature according to the position of the sun. 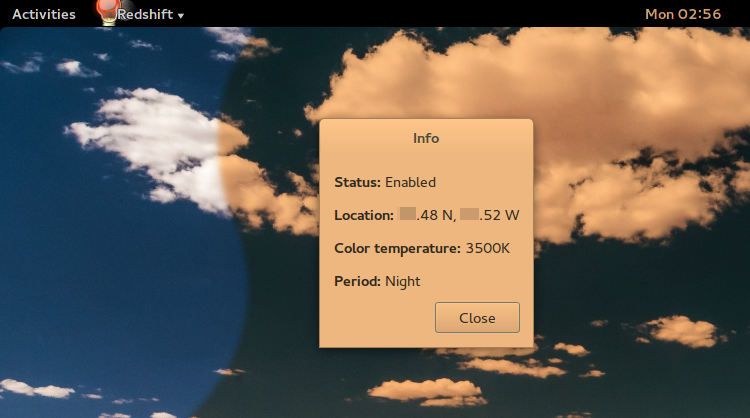 A different color temperature is set during night and daytime. During twilight and early morning, the color temperature transitions smoothly from night to daytime temperature to allow your eyes to slowly adapt. At night the color temperature should be set to match the lamps in your room. This is typically a low temperature at around 3000K-4000K (default is 3700K). During the day, the color temperature should match the light from outside, typically around 5500K-6500K (default is 5500K). The light has a higher temperature on an overcast day. ## Notes * It’s a command line utility. Run redshift.exe -h for help on command line options. Be aware of Windows limitations.